Recognizes the major risks in choosing from the sourcing options available. While Blue Prism customers prefer insourcing, most also use consultants or advisors as partners. 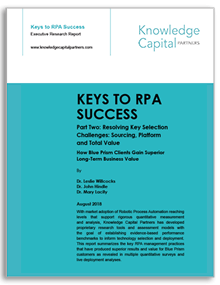 Expresses a clear preference for an RPA platform that is scalable, and that provides a secure, enterprise-grade solution. Speed to adopt and ease of use are more secondary, with lower priority also given to reusability, auditability, multi-skilling capability, and cost. Improves their analysis of business value by calculating total cost of ownership and identifying short- and longer-term business benefits. Helps organizations strategize by adopting the concept of Total Value of Ownership (TVO), moving managers from a low cost/quick win mentality to treating automation technologies as long-term strategic investments, and part of a larger digital business value program.